I have used clear tablecloth protectors for years over cloth tablecloths for our table which we eat at everyday. They protect the table cloth well, so I have wash the tablecloth much less often. When company comes and I want a more formal look we just take off the tablecloth protector and go with the cloth tablecloth. 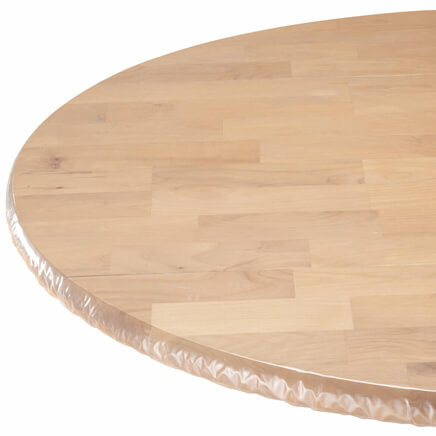 They offer several different sizes, which is great to insure that you get a size best for your particular table. I use my dining room table for baking, I'm tired of flour and crumbs on my good table clothes. To protect new table cloth from spills, and food stains. I like to use a clear plastic tablecloth for use with my linen tablecloths to keep stains from happening!!! To protect my tablecloth during food prep. I wish it could be soft-folded to eliminate wrinkles & creases. These tablecloth protectors are great to keep my nice holiday tablecloths clean and stain/spill free. I use them all the time with my good tablecloths and don't have to worry about ruining them. Always on Holiday gatherings for dinner there are a lot of children and my tablecloths seem to always find the gravy that won't come out or blueberry stains and the like. So the protector was a plus. first time I get to use the same Christmas table cloth again due to it being protected. I would like to use my good tablecloths without getting them permanently stained. This looks like it may do the job. 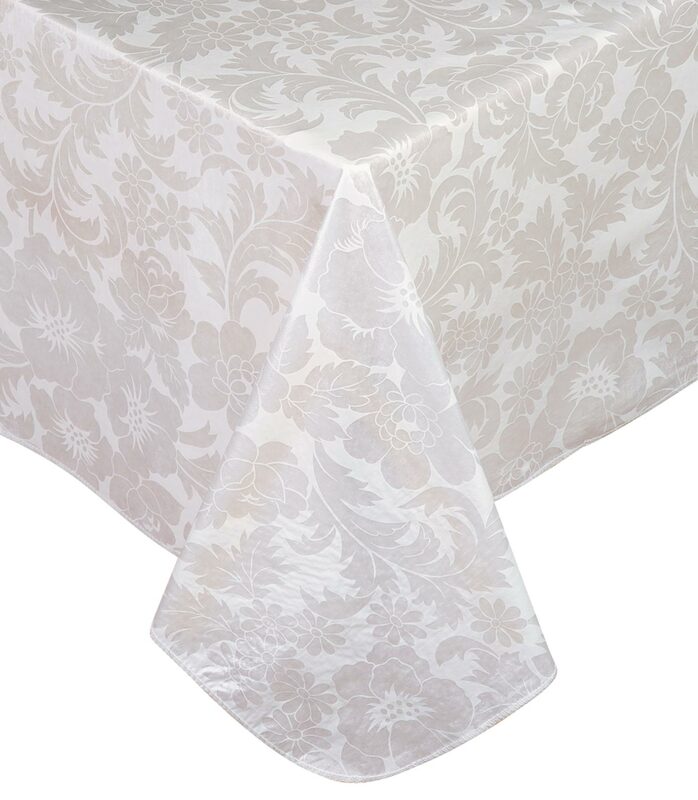 love these,i can put any tablecloth under the clear one and don't have to worry about my fine linens . Present one got a hole in it. Always keep a clear cover on my tablecloth until I have guests for a meal. Keeps my tablecloth clean. I wanted to have a nice tablecloth on the kitchen table but wanted to protect the tablecloth. Chosen before and liked it. They preserve my tablecloth until I use it for company. To protect tablecloth and still see the design. Purchased one previously, now I ordered one for my cousin. Great purchase. I use these all the time to protect tablecloths. Have ordered the protectors in the past. Happy with the quality and felt it was time to order more. got a beautiful table cloth the other day for fall but was not vinyl so needed to go buy a plastic cover. I am hoping this does the job cost is good and saved me a trip to find. The dress I ordered last month in a different color, and I liked it so much that I ordered this color. It is very comfortable and nice and light for the summer. As far as the table cover, it was just time to get a new one. Need to replace the one I have. I had a seamstress sew a table cloth, curtains and seat cushions to match in my new kitchen. These clear table protectors keep my table cloth nice and clean and you can see because it is clear. 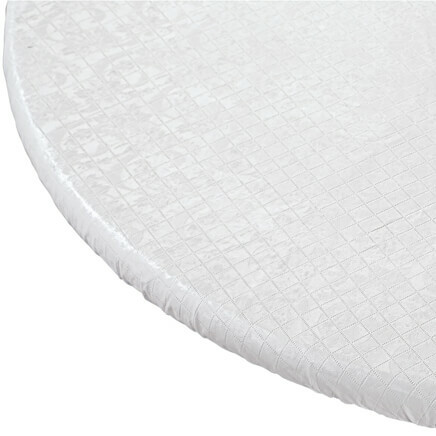 Need to protect everyday tablecloths from stains. Need to protect recliners and table. Previous ones I ordered lasted a long time. Tablecloth protector does tear easy after it becomes hardened with time. Keeps my tablecloth clean. Less work over holidays. I use cloth tablecloths every day. In the pas I used plastic tablecloths to protect them and then got away from it, but the messes my husband and the boys make when they eat! I decided to go back to using them again. To protect the tablecloths I have. I'm having a graduation party soon and I want to put pictures on top of tables and not hurt the pictures. it keeps the tablecloth clean?? Tired of washing cloth tablecloth so frequently and having a faded cloth. Put this on top of tablecloth cleans up great, minimizes need to wash tablecloth underneath. what is the thickness in mil/gauge? BEST ANSWER: Thank you for your question. The thickness of the Clear Tablecloth Protector is .06mm. At this time we do not have a table protector thicker than the .06mm. We apologize for any inconvenience. 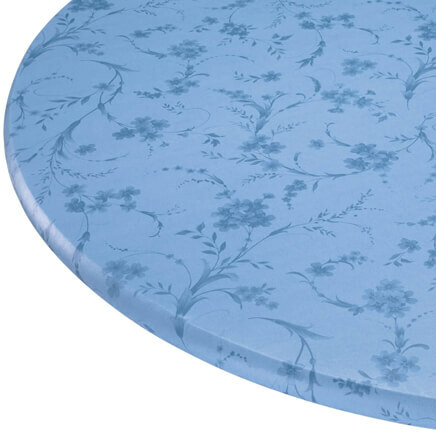 Clear Tablecloth Protecor--does "oblong" mean oval? I want a rectangle. BEST ANSWER: It is not an oval just a gently rounded corner rectangle. Me again. 'Sorry I can't delete the first two answers I sent. If you click on the "more details" button under the photo, you'll see icons of all of the shapes. The oblong is a rectangle with slightly rounded corners. Oblong is oval or a rectangle without 90 degree angles formed when two sides of unequal length meet in curved fashion . That's why two different dimensions of each pair of sides are given. Oblong means rectangular in this case. I use it over a cloth tablecloth on my rectangular dining room table. Oblong means rectangle. I bought a round for my round table. This table cover is a rectangle with square corners. 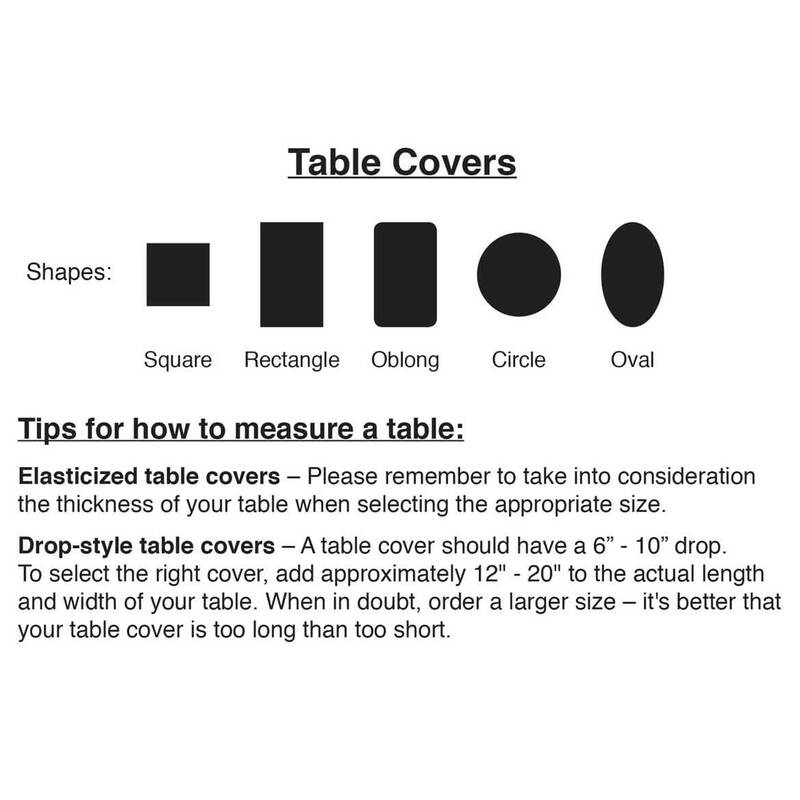 Are the sizes listed table sizes or cover sizes? BEST ANSWER: I never paid any attention to it one way or the other., but the 52x70 I have bought for our kitchen table fits it fine; it hangs over just a little bit on the ends and sides and I like that...will buy more soon. Thank you for your question. The sizes we give will tell the customer what size table it will fit. We hope this information will be of help to you. I have only purchased the round option, but for me they have been cover sizes. I bought table size and it draped over each side. 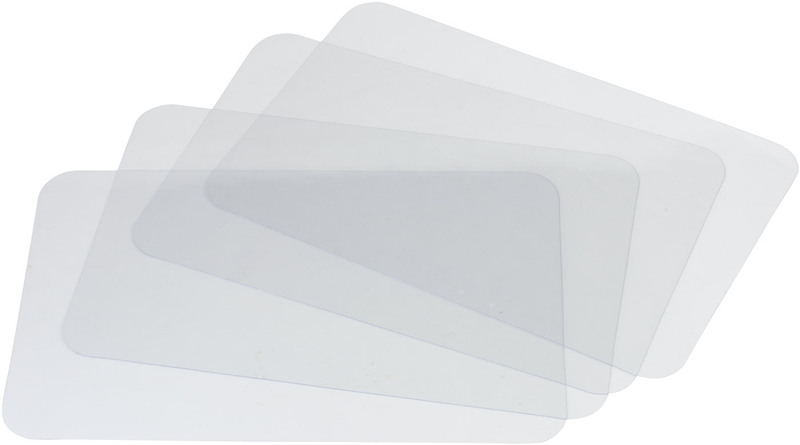 what is the thickness (gauge) for the 60 X 108 clear tablecloth protector? BEST ANSWER: Thank you for your question. The tablecloth protector is .06mm thick. We hope this information will be of help to you. I have it on my table. It's not too thick but it works! NEED 90''COVERS. DO YOU HAVE THIS SIZE? BEST ANSWER: Thank you for your question. 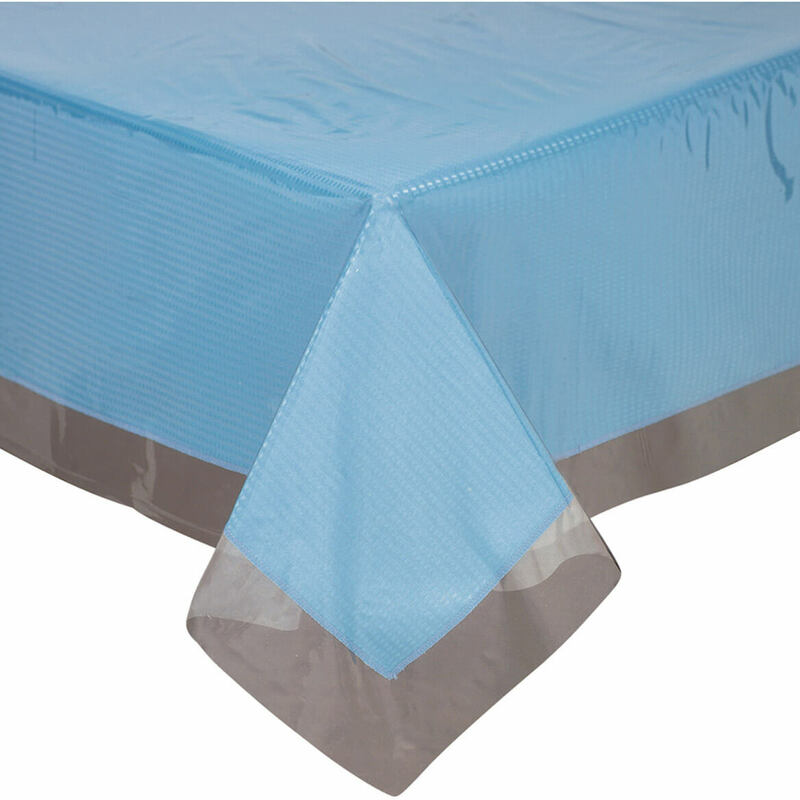 Our 60" x 90" table cloth protectors are available. We hope this information will be of help to you. Can this be cut to fit? My table is 42" x 60", and I don't want so much overhang. BEST ANSWER: Thank you for your question. Yes, this item can be cut to fit. We hope this information will be of help to you.